On Touch Actions are used to modify the visual appearance of your component when a user touches it. Usage is very simple: when a user touches the component, the component can change its color or text to denote the action for the end user. 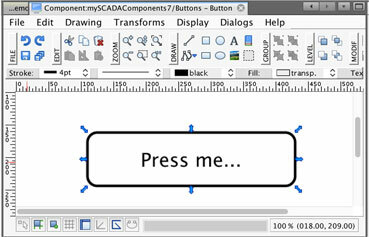 When the user releases their touch, the component will return to its default look. 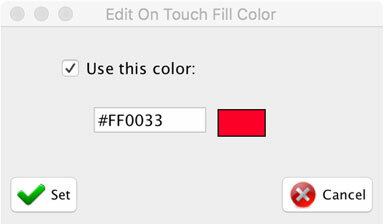 We will create a simple button that will change the background color on touch. Now, you can test your component. In the following example, we will create a simple slide bar showing the variable progress and its Min and Max values. 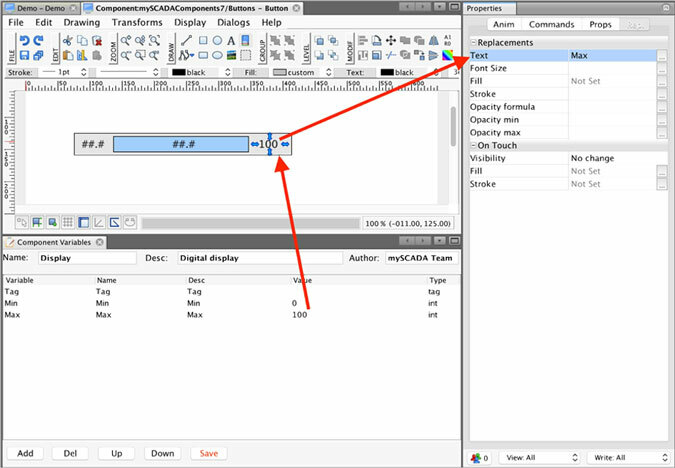 Create a new component and draw a rectangle, as seen in the picture below. Copy the selected rectangle and apply Paste on same location to it. Set the Fill property to “none” then put the element in the background with the function Lower to the background. We have now created a frame of the scale. As you can see, we have created 3 local variables. 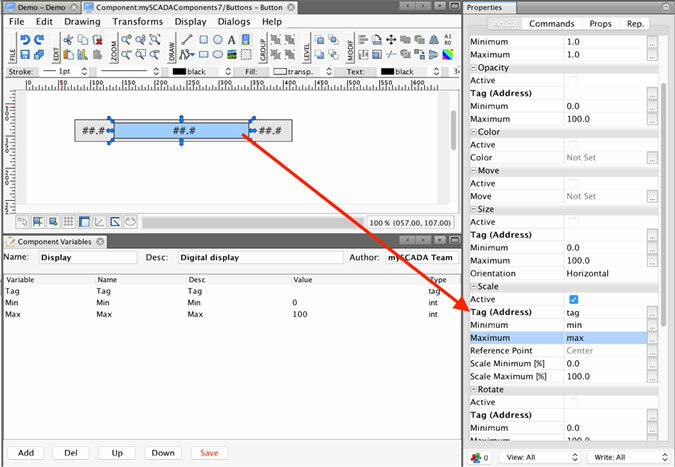 For the tag value, you have used a variable tag; for specifying the minimum and maximum values, you have used the min and max variables. We also want to show the actual value in the middle of the slide bar. Click on the text field in the middle of the rectangle, select the Anim tab in the Properties window and click on the Tag (Address) field in the Show Value section. Then, fill in the Tag field with “tag,” which corresponds to our local variable name. As you can see, we have used one of our local variables. You can use the same variable (especially the tag type) for multiple animations/effects to achieve a better effect. We will also show the Min and Max limits of our tag. Click on the right text field, then select the Rep. tab from the Properties window and set “max” for Text in the Replacements. Save the component and test its functionality. Create a new view and open it, then navigate to the Library. Select your component and press the Insert button. In the Component section, you can see all the local variables that you have defined.